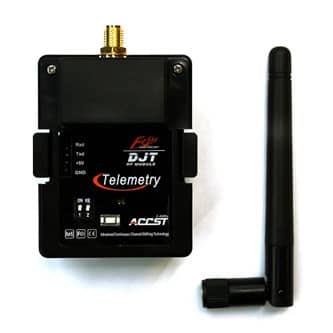 The DJT telemetry transmitter module is a great choice if your transmitter is compatible with the JR modules. 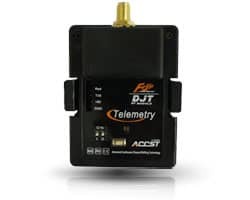 The Telemetry Radio System developed by FrSky provides an additional return link that is used for monitoring the Rx’s voltage, poor receiver reception, temperature, location, speed and so on. The module is compatible with both the V8-series (non-telemetry) and the D-Series (telemetry) receivers. JR: 347, 388, 783, U8, PCM10, PCM10S, PCM10SX, PCM10IIS, 8103, J9303, MX-22, MX-24S, PX, 9XII, Eurgle 9X, Turnigy 9X, 9XR and many more radios.